Abstract: Supports 2 GB of DDR, USB 2.0, Ultra DMA133 IDE RAID, 5.1 channel audio, Gigabit LAN, integrated IEEE 1394 Firewire and six PCI slots! One of the biggest problems with the i845E/G chipset is that the Pentium 4 FSB increased from 400 MHz to 533 MHz, the available memory bandwidth to the processor didn't. Consumers with 533 MHz based P4's were still paring them up with PC2100 memory and performance suffered consequently. To get around this problem, Intel has just released the i845PE/GE which officially brings the Pentium 4 processor and PC2700 DDR memory support together. As usual, MSI is one of the first manufacturers to have adopted the new i845PE chipset, and with it they produced the MSI 845PE Max2-FIR motherboard. Following the recent trends from this company we are faced with a board that has literally everything on board (in the most desirable configuration that is). With three 186-pin DIMM slots supporting up to 2 GB of PC1600/2100/2700 memory, integrated USB 2.0, Ultra DMA133 IDE RAID, hardware based 5.1 channel audio, Intel RC82540 powered Gigabit 10/100/1000 LAN, integrated IEEE 1394 Firewire and six PCI slots! With specs like that you can understand why I've just upgraded my office computer with this model board. Throw in one of those optional MSI Bluetooth kits and you have one mean little red motherboard! The only missing component is Serial ATA, but since those SATA hard drives still haven't popped up in stores, this is something we can live with quite easily for the moment. The 845PE Max2-FIR is a 24.5cm wide ATX motherboard so if you have a small tower case be aware that the lower 5.25" bays might not be useable with longer CD-ROM's. We dry fitted this case in a standard Aopen QF50A case and found that the metal frame for the drive bays butts up against the edge of the PCB - so the board does fit without a problem. Installing an LG 52X CDROM into either of the lower two bays on the other hand proved that a board of this stature may cause issues with some cases. In any case, it really isn't a problem, but if you have a lot of CD-ROM's and are unwilling to move to a full tower case, then it is something to keep in mind. 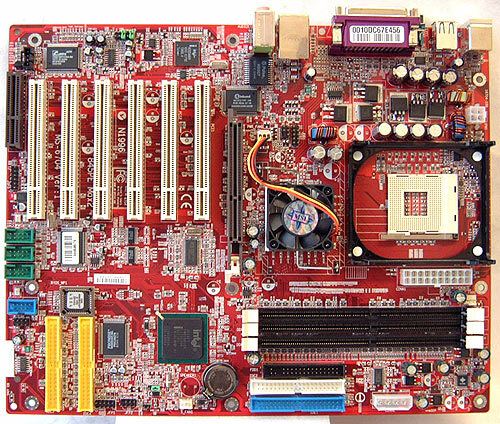 Moving on, the general layout and placement of the components on a motherboard is not something which can vary widely. Locations of items like PCI sockets, AGP sockets and the I/O headers are pretty much written in stone. By simple thermodynamics and North/Southbridge locations, the processor is always going to be at the top of the board. DIMM sockets sometimes move around, but in general they are always in the same orientation. What does that leave to move around? The power connectors for starters, and then the FDD and HDD cable headers. In the 845PE Max2-FIR's case, the main 20-pin ATX power connector is in a good spot, straddling both the processor and memory sockets nicely. The auxiliary 4-pin power connector is also well placed, and in addition to those two is a standard Molex connector. The extra power requirement is something which surely comes in handy when all those extra on board devices are being used as well. Pg 9. Blue BIOS, Red PCB - What's the final say?